In the previous article we talked about the innovative Italmodular protecting counters PROTECT LINE® . Now we present you our innovative rolling shelves line IM|92. IM|92 system is the ideal solution for anyone needing to organize, handle, display and make the most of available storage space in compliance with hygiene standards. The IM|92 system lends itself to a host of different applications, ranging from catering to the hotel industry, from walk-in refrigerators to the whole food industry, from the pharmaceutical trade to storehouses in general. 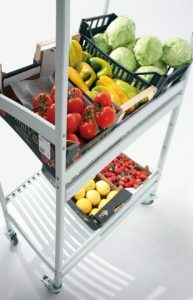 Modular trolley has been designed and manufactured to carry all manner of foodstuffs and other products. It comes in food-safe anodized aluminium. Moreover it stands out for its excellent strength, stability and practicality. With an elegant design and quiet operation, it comes in an extensive range of standard sizes. It also has shelves made from anodized aluminium 20 microns thick or polyethylene. This makes it the optimal solution to meet the needs of numerous applications. A tray trolley designed to display and store all manner of products. A practical, elegant system for putting crates of fruit and vegetables, wine bottles, bread baskets, trays of flowers on best display. It’s quick and easy to assemble, in fact you can put it together in a wide range of sizes and adapt to cater to any display need. 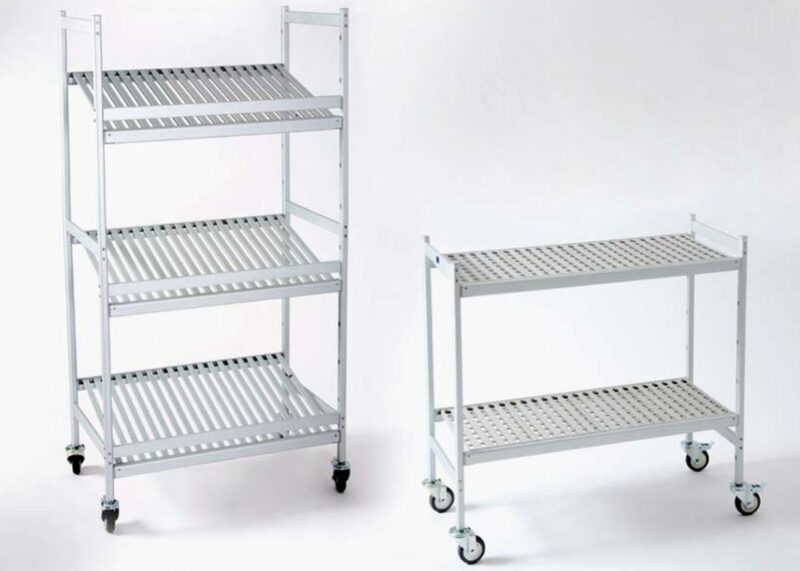 Both types of trolleys have been built to take heavy loads with minimal bending. Shelves are easy to remove and are easy to clean, making them thoroughly hygienic and thus food safe. The galvanized steel locking swivel castors make them particularly safe, easy to handle and quiet even when carrying a full load. An other rolling storage shelves by Italmodular is the new SMARTY trolley. It is an innovative patented container and tray storage system, specially designed and manufactured to optimize and increase storage space in canteens, large-scale kitchens and fast-food outlets. Furthermore it is versatile, strong, universal and quick to fold away. Its patented folding structure requires no assembly and saves more space when not in use and during shipment. This makes it the ideal solution for modern cooking, food preparation and storage systems. In anodized aluminium alloy with fully removable foodgrade plastic walls, Smarty Trolley delivers an high standard of hygiene in the workplace. 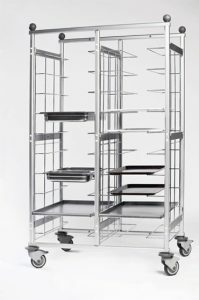 In fact, both the side walls made from foodgrade plastic and the chrome racks can be removed effortlessly to allow the trolley to be cleaned thoroughly. Moreover the solid and stable structure gives this trolley a 120kg load capacity. A single frame accommodates multiple container types. You can use Gastronorm (GN) and Euronorm (EN) containers, baking pans and trays, all within the same aluminum frame.